22.09.15 How the inhabitants of Easter Island managed to erect those immensely heavy statues, the Moai, along the cost is still a mystery. Many theories have been formed on the topic, but no convincing evidence has been presented yet. In Orongo, it doesn’t matter how we do it, as long as we do it fast! The first player to erect all his Moai wins the game! The board depicts Easter Island, with a grid of hexagons. There are seven different illustrations depicted on the hexes. The aim is to connect specific symbols, by forming a route of transparent tokens in the player’s colours. As soon as a connection has been made, a Moai may be erected along the coast as a reward. For example, a birdman has to be connected to a nest, et cetera. Despite the fact that these symbols are printed on the board, they are not really there yet. Only after the corresponding (numbered) tile has been drawn and placed on the board, the location becomes ‘active’. Depending on the number of players, 3 or 4 new tiles are drawn each round. The players bid with shells in order to place their tokens. Everybody reveals their bid simultaneously. The highest bidder pays his shells, and places three tokens on the board. The second-highest bidder may keep his shells, and place two tokens. All other players also keep their shells, and place one token. Only the players with a bid of 0 shells are not allowed to place a token. But, they receive all the shells from the supply! And this supply consists of the shells paid by the highest bidder of the current round, but also of previous rounds! Tokens are placed only on ‘active’ numbered fields, or on a palm tree field adjacent to any field occupied by one of your tokens. 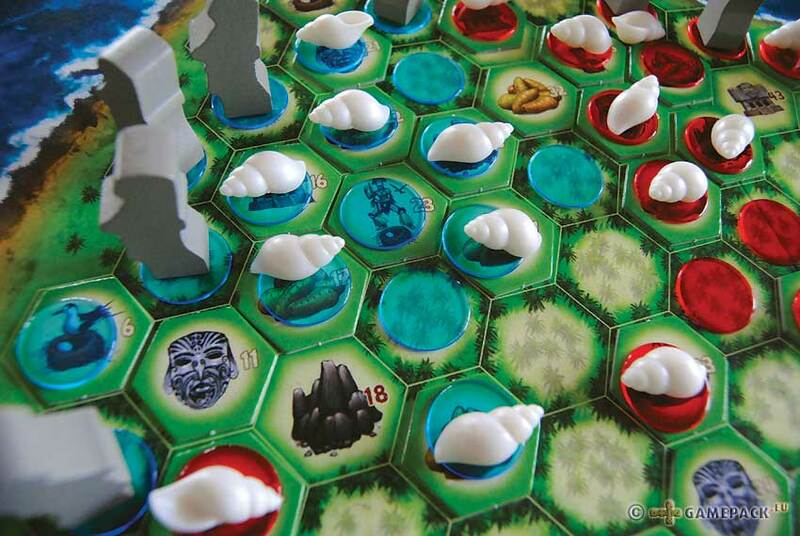 As soon as you have managed to connect two symbols that belong together, you immediately place one of your Moai on a coastal palm field within the same group of tokens. Additionally, the two symbols are covered with two of your shells. These shells stay there for the remainder of the game! 27.09.14 The harbours of Norderkap, Trutzhavn and Olesand are under frequent attack of pirates! The players are sea captains with the double task to firstly provide these cities with the necessary goods, and secondly to protect them from pirate attacks by attacking pirates themselves. 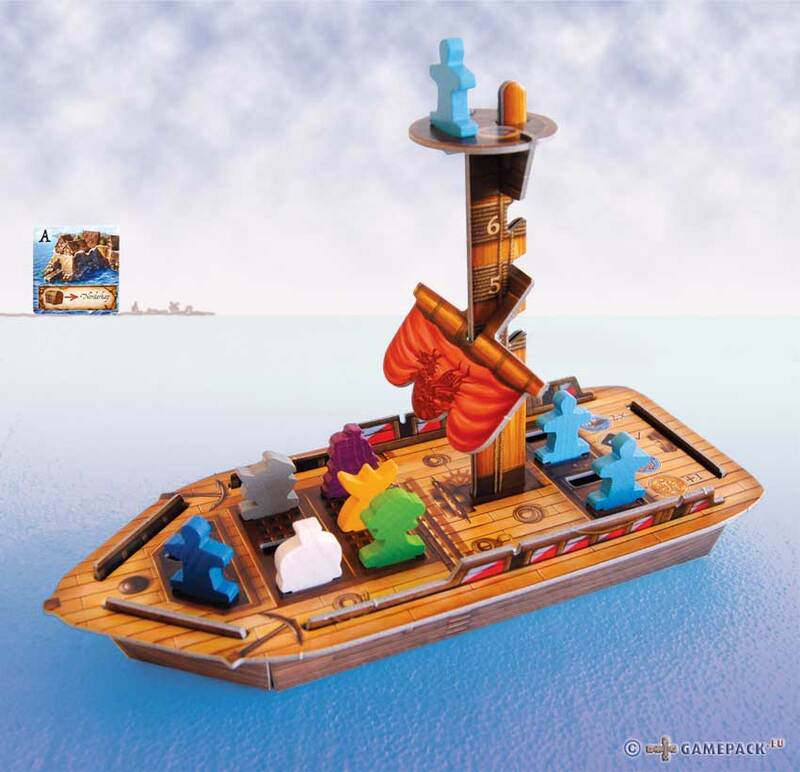 Each player has a real 3D ship with room for several goods, with a prison for pirate captains, with room for no less than four cannons and four crew members, and an adjustable sail! 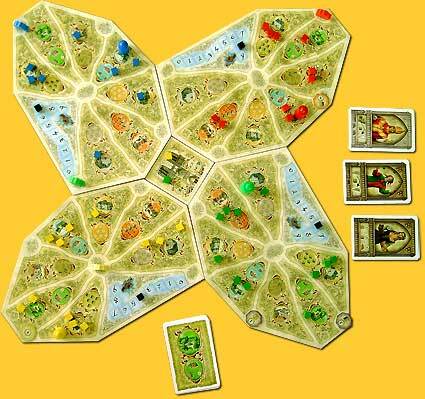 The gameplay is identical to the Catan-cardgame Sternenfahrer by the same author. In his turn, a player selects one of three stacks of cards (coupled to the three harbours). The player reveals the cards one by one, and decides for each card whether or not he wants to carry out the depicted action. The position of his sail determines how many cards he may sail through (4 to 6), but irrespective of this number, he may carry out only two actions per turn! After his trip the cards are shuffled again, so there’s no need to memorise the order of the cards. The actions include buying or selling goods at a set price, upgrading your ship (purchasing cannons or crewmembers, adjusting your sail position) and fighting pirates. The most important action is the action associated with the harbour: deliver the demanded goods, coins, or pirate captains and place a cube in your colour on the board. The first player to place all his (8-10) cubes wins the game. As mentioned before, Norderwind is strongly reminiscent of Sternenfahrer. Here, you also travel in decks of cards, and increase your chances of success by upgrading your (space)ship. But Norderwind is definitely a simplified family-version. There is not much to it: in no-time everybody knows in which stacks which goods can be bought for little and/or sold for a lot. With the money you make you can upgrade your ship, which gives you additional options and a better chance to beat pirate ships. Each stack always consists of 8 cards: no cards are ever removed or added to the stacks. With your sail in the maximum position you can travel 6 cards; with a crew member in the crow’s nest you can look at an additional card. So, if you are looking for a specific card, for example the harbour-card, you are almost certain to reach it within your turn. The game even has interaction: when the active player chooses and carries out an action, the other players are also allowed to perform this same action if they are willing to pay a letter of credit. These letters of credit can be obtained when a player in his turn performs only one or no action instead of the allowed two. 20.05.13 Four powerful guilds have entrusted us with the task to build a city. There are no blueprints available: the city will go by the name 'OddVille', so it's no problem at all if it turns out to be a chaotic mixture of architectural styles. The player with the best contribution wins the game. OddVille starts out as a single square, and from there on players can add buildings. In a player's turn, he can choose between playing a worker card or expanding the city by one building card. All players have four worker cards. They each have three functionalities, only one of which can be used in a turn: taking money, buying building materials or buying a building card. To collect money, a player takes as many gold cards as indicated on the worker card (0 to 3). For the building materials there is a separate board depicting the four types of building materials, with spaces with different prices. If a player wants to buy a resource, he places a worker of his colour on the cheapest available space of the desired building material and pays the depicted costs. He now virtually possesses this building material until he uses it: at that moment his worker is removed and the space becomes available again. There are six building cards placed face up in a row. Players may, depending on the worker card they played, choose one of the first 1 to 4 cards for free. The other cards cost money. The building card is placed face up in front of them, ready to build. But in OddVille they despise these notorious never-ending, or even never-really-starting, building projects: players are never allowed to have more than two building cards in front of them! Players that want to build a building take one of their previously purchased cards, pay the demanded building materials by removing the corresponding workers form the building materials board, and add the card to the city. The only rule is that the card has to be placed adjacent to at least one other cards, and all the roads have to be continued. To prove that the building is his, he places a worker in his colour on the card. 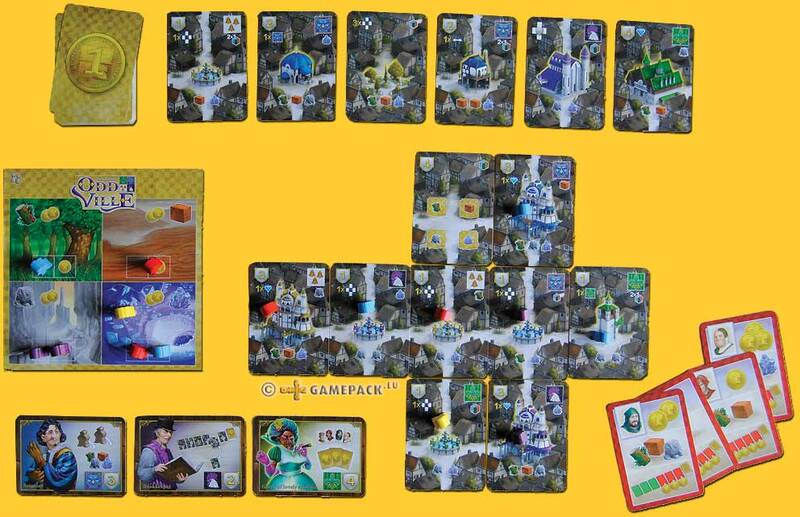 All cards depict a bonus in the top right that a player receives immediately after building (usually building materials). In addition, he may also collect all bonuses of adjacent cards that are connected to his new card by roads. As soon as a player places his sixth building, the game is over. The points are scored: all buildings show in the top left how many points they score at game end. Sometimes they score a fixed number of points, but more often the number of points depends on the final lay-out of OddVille. Three points for each adjacent card, one point per diamond-symbol in the city, et cetera. As one can imagine, this encourages the player-brains to build buildings that already have high potential for the final scoring, for example a building that scores points for each diamond symbol in town becomes interesting when diamond-symbols are beginning to build up in OddVille. And of course the owner of this building will try to add even more buildings with diamond symbol, to make his building even more profitable. 29.03.07 What about the rats? A not very common, but in ‘Notre Dame’ not unusual question, as our acting is severely determined by it. The health of our quarters are at stake, but it is more that the rats are a spin-off off the masses of people that perform all sorts of little tasks within the city walls such as driving around in little carriages, searching for victory points, bringing the children to scholl or have treatment in the hospital. Who shows up in the park, or equips the sanatorium well, can be reassured of good health and does not have to fear illness that our little nightly friends spread out. The ones who exceeds the Paris Rat Standard, have to hand in two victory points at the end of each round, as well as an influence cube, it does not come any more realistic. With four of these cubes a player starts the game; during the game more can be collected. Each player has his private blind deck of nine action cards, of which he takes three in his hand at the start of a round. A game lasts three rounds of, ehrm, three rounds - so nine rounds actually, with only short interruptions at the end of each third round for the scoring of the Notre Dame quarter where also points can be earned. A player deck thus is played three times in a game, shuffled at the end of each third round. From the drawn three cards, a player may keep one; the other two are given to his lefthand neighbour. At the same time he gets two cards from his righthand neighbour, keeping one card, passing the other. This way each player starts each round with three cards, of which he may play only two; the third card is discarded with the playing of the second card. On his player board each player has the same buildings at his disposal. If he plays an action card for a building, he first places a cube on the corresponding quarter, and then receives the revenues from it; with every additional cube, the revenues get higher, be it money, victory points, cubes from the stock or movement for the carriage. At the beginning of each round, three character cards are revealed that may bring extras but have to be bribed for money in order to receive them. Unfortunately these characters also are responsible for the rats in the gaem: the bottom of each card may have zero to three rats, the sum is the amount that has to be controlled for that round. By putting a cube in the sanatorium, each time a rat can be controlled; this also goes for the park - a player may put his black pest stone one space back on the water/rat track just outside the quarters of the city. At the end of a round all players put their pest stone forward the sum of the rats on the character cards, with personal substractions for the amount of cubes a player has in the sanatorium. The pest stone never may exceed the ‘9’ on the track, otherwise the abovementioned sanctions take effect. Each player more or less has his own fate in his hands; he chooses which card to keep and play, and hopes for a matching second card from one of his righthand neighbours. What to do: bring the sanatorium at full strength, thereby keeping the rats away, or start right away with collecting points with the carriage that reminds a bit of a Volkswagen Beetle? Running out of money is not good either; this way it will not be possible to buy a participation in the Notre Dame quarter, or bribe one of the characters. It will be clear that there are many ways that can lead to victory, but there is no clear path. This also comes from the fact that the action cards are presented and available for play in a random way. And how much a player would like to keep not one, but rather two cards he just drew from his deck, he may only keep one. Sometimes however, your neighbour happens to have other priorities, and passes the card you had to pass yourself but would like to have kept. You have to have a bit of this kind of luck then, in ‘Notre Dame’, but does it matter? Well, no, we are quite enjoyable busy trying to optimise our moves, and sometimes this works out better than on other occasions. Despite the fact that each player has to fight therats individually, there is a feeling of solidarity when the character cards are revealed - what ? eight rats! Or: oh, only three rats, no problem! We do a little of this, and a little of that, and hope that this will bring us more points than the other players. Because of this there is a sligthly gnawing (!) feeling that we fail to have a clear direction; there is no grande finale either where we have to work towards. This is no necessity, not at all, ‘Notre Dame’ is a nice game to play; however, players who hoped to expect a second ‘Puerto Rico’ or ‘Die Fürsten von Florenz’ will have to continue their prayers. 21.10.06 O no, not yet another route game! Nevertheless this is exactly what we have here. In the wake of the success of 'Ticket To Ride' and its German nephew 'Thurn und Taxis' it is the London Underground that serves as platform for this route building game. Technically everything goes along the same lines: laying track and scoring points. The assignment cards have been replaced by destination cards from which four are laid open. A general token travels each player turn to the nearest gold coloured location, preferably not on foot and with as little changes on the underground line. Whenever this destination is reached, another location is picked from up to four blank locations, under the prerequisite that these colored destinations are available among the four cards, that are resupplied to four after each player turn in which or two destinations have been reached. The travelled route scores points: one point for each continuous chain of track of each player that the token has used in reaching the destination. In a turn a player may build up to four track in one of his player colours; dependent on the amount of players he has two, three or four colours available to him. Once started with a colour, all track of the same colour must be connected to this track. Bonuses may be earned by reaching terminals, important junctions, or the joining of two similar symbols. Twines may be used but these must first be earned in other actions. When the card pile is depleted and all locations have been visited, the game ends and the player with the most points has won. 'On The Underground' has more than one resemblance with 'Ticket To Ride', Clippers' and 'Santa Fé Rails', all by Alan Moon, that this almost makes it plagiarism. It must be said, however, that with the series of route games that Alan Moon published he has copied himself numerous times. 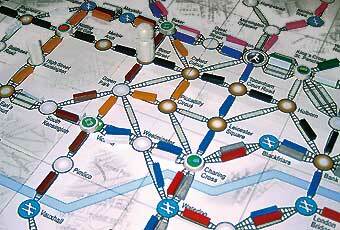 'On The Underground' plays somewhat more grinding in a way, as there is more finding out how the token will travel within the system of the underground. It is not that inventing and publishing games of this type solely is the territory of Alan Moon; it's just that enough of these games already have been published. Despite the fact that this game is quite enjoyable to play, we expect smaller publishers to be more inventive in the kind of games they publish, making a difference from the larger publishers. Instead we are treated with the same middle of the road game we have seen many times before. Reasons enough to nominate this game for a 'Toodle-A-Dokey' award!